Piggy Riches is a 5 reel, 15 line multiple coin video slot that features scatter wins, free spins and wild substitutions. Simply click on a scatter symbol to select the free spins and achieve a multiple win depending upon your selection. You can play 1 to 15 bet lines at 1 to 10 bet levels. Scatter wins pay total bet x payout displayed in the PAYTABLE. 3 or more Scatter symbols appearing anywhere on the reels in the main game activates Free Spins. Free Spins are played at the same number of bet lines, bet level and coin value as the round that activated Free Spins. Each winning scatter symbol shows a Free spin and multiplier combination. The multiplier is applied to all wins in Free Spins. Choose one of the scatter symbols to start playing Free spins. Scatter symbols appearing on the reels during Free Spins only award additional Free Spins. Scatter and Free Spins wins are added to any line wins. 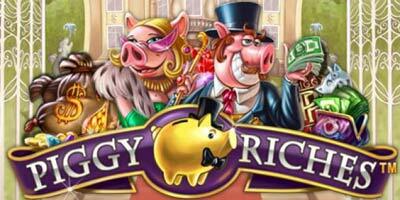 "Piggy Riches video slot * How To Play * Demo * Free Spins"